Bulk Powder Containment Enclosures are designed to provide safe weighing and manipulation environments for powder dispensing operations from drum containers. The enclosure is ergonomically designed to allow access to drums of powder within a mobile contained environment. 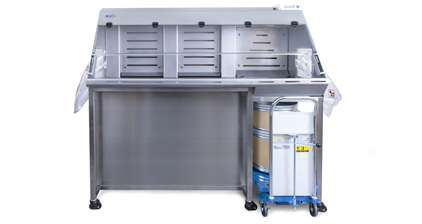 The bulk powder unit is a simple to use alternative to a built in downflow booth and offers containment levels of less than 30 nanograms/m3. BP series Bulk Powder Containment Enclosures are specifically designed to provide a safe weighing and handling environment for large quantities of active drug compounds from drum containers. The BP enclosure range have a unique low flow design that provides localised extract around the drum opening and a low turbulence environment for weighing.